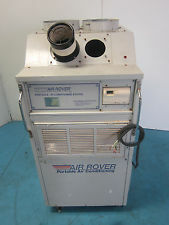 Small portable cooling units come with small castered wheels and can be easily rolled inside the space to be conditioned. A 1 ton portable cooling unit can cool typically up to 200 square feet and a 2 ton portable, up to 400 square feet. 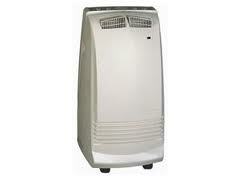 Rent these units for small classrooms, office cubicle, or residential cooling during those really hot days. Power requirement: 120 volt (standard residential receptacle) this accommodate power at most all locations. A 6 foot power cord is included with the portable cooling unit along with 25 foot of hot air flex duct with each unit. The hot air duct is ran outside of the conditioned space to eliminate the hot air. When cooling is done moisture is removed (condensed) from the air. This condensate water is collected in an internal condensate drain pan that typically needs to be emptied daily. A special shutoff automatic feature shuts the unit off when the pan is full to prevent inadvertent water spillage. Some units have a condensate drain pump that will pump the condensate to a nearby floor drain or sink. Your friendly sales-engineer can help you select the best combination of small portable AC units and or generator for a turn-key rental experience. We would be happy to come out to your location to assess your location for the Best Rental Choice and setup and provide you with a rental quote, call La Brea Air today.